Author's note: Investment markets can be confusing. To try to cut through the chatter and investment slang, we present this monthly view to you. We want to give you a 50,000-foot view of market conditions updated as our view evolves. Currently, our Investment Climate Indicator remains at Stormy. Stormy means that bear market rules apply, and we believe could be a period of wealth destruction. Is This the Eye of the Hurricane? While I grew up in New Jersey, I have lived the past 22 years in South Florida. That means I have now learned all of the basics of hurricanes. One classic feature of hurricanes is that the part that is spinning in circles (that does much of the damage) has a separate part in the middle called the eye. The eye is like the hole in a donut, and when it passes over your neighborhood, you don't feel at all like a hurricane is near. The weather is nice and sunny. But you also know that the other part of the storm is coming behind it. I continue to think that late 2018 was a crash-test of sorts, and that we may very well be in that eye of the hurricane right now. That means that at some point, the lows of 2018 will be taken out, and perhaps by a wide margin. But like a hurricane, it is unknown to all of us at what pace the financial markets moves from the eye phase to the resumption of the intense storm and the damage it inflicts on investors. So, rather than a weather forecaster, I will continue to point out the risks alongside the rewards, instead of trying to time such major events. After all, investing is a constant assessment of potential rewards versus potential for risk of major loss. At least, that's how I have always rolled. I am not a bull or a bear, I am a realist and a devout risk-manager. After 10 years of market gains, debt building, and accelerating wealth disparity (i.e. vanishing of the middle class), it's just a matter of time before confidence breaks. And, as December's market crash-test reminded us, wealth is lost far more quickly than it is gained. So, the bottom line is to be careful, understand what you own, and respect the laws of gravity. That said, a trend is a trend until it is broken, and the powerful up trend in global stocks is alive and well, until it stops. Like a carnival ride. So, the best advice now is to be flexible, expect anything, and remember that preserving capital is always the priority at this stage of the market and economic cycle. Listen to Rob Isbitts and Bob Powell discuss this month's outlook. 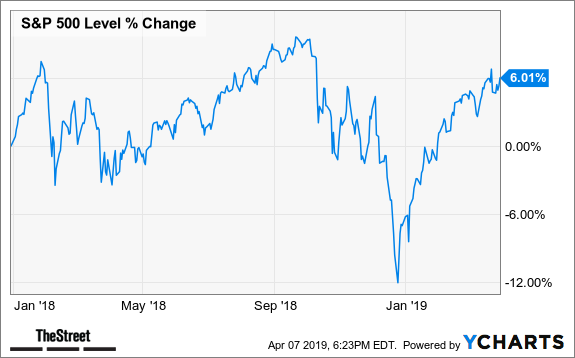 In March, the S&P 500 Index added 1.81% to its stellar first two months of the year, capping off its best quarter since 2009. The S&P was up 13.52% for the quarter. That's an annualized return of 66%. Wow, that's great isn't it? Hello, new stock bull market. But wait, that's just the headline and someone's quick summary of it. And if successful long-term investing is about anything today, it is about getting the full picture, not just the headlines. Below is a chart of the S&P 500 from the start of 2018 through the end of the first quarter of 2019. 15 months, lots of drama, but no clear conclusion about where we are in the investment cycle. And like a TV drama series, the debate over climate change or the Mueller report, the drama never ends. It just enters a new phase. Fortunately for those of us who invest and follow the markets for a living, the financial markets are not a series that will get canceled by an executive at a TV network. To put the first quarter of 2019 in context, let's say that it's a good thing that the stock market had an outstanding start to 2019. Because coming off of the late-year doldrums of 2018, anything short of that might have crushed investor confidence. And that is one of the few things keeping this most remarkable bull market going. The other graph (below) hearkens back to 2008 and 2009, the heart of the financial crisis which started back in early 2007 when Bear Stearns, a prominent investment bank, fell apart. Lehman Brothers followed later on, and the rest is history -- very unprofitable history for those who took a long-term only, set-it-and-forget-it approach to investing. Unfortunately, I think too many investors are still of that mindset, thanks to a decade that has erased much of the memory and emotions of the financial crisis, while many of its symptoms remain. As you can see below, that big rally during the third quarter of 2009 was the second consecutive quarter of double-digit gains for the S&P 500, coming out of the financial crisis. In fact, from March through September of 2009, that index brought itself from the depths of a more than 50% decline from the 2007 peak to the point where it was only about 26% off that peak. That was a lot of ground made up in just six months, but it is not anything like today's situation for investors. While some on Wall Street -- whose job it is to always put a positive spin on long-term investing approaches -- will point to 2019's start as the end of the beginning of something fruitful for index investors, they are making light of the current overhang on the global economy that is starting to become more apparent by the day. In 2009, it turns out the worst was truly over. In 2019, betting on the same thing is dangerous. 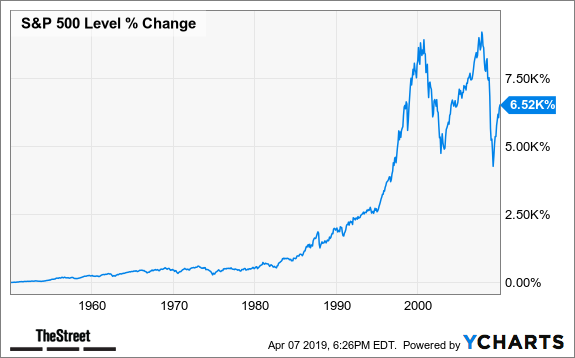 This chart depicts a period of time when an investor in the S&P 500 Index would have spent more than two years earning way less than zero return, and for every $100,000 invested, would have had a balance hovering in the $75,000 range. Add a multiple or a zero or two, and you can apply that to your own personal situation. The bottom-line for me: understand that we are currently in a point of the investment cycle which can potentially produce high returns, but that potential comes with far more risk than at any point in the past decade. "Stormy" is still the theme from an intermediate-term perspective, and history will inform us as to whether the past few months were a true bullish anomaly amid a tougher economic background, or the eye of a hurricane. My wife and I are big fans of the band Train. And a line from one of their many popular songs is that "when everyone else is getting out of bed, I'm usually getting in it." That's what the bond market may be thinking about itself right now. With all of the attention on the stock market's recent revival, the bond market has been on fire. The 10-year U.S. Treasury rate started March at 2.76%, and then marched all the way down to 2.39%. 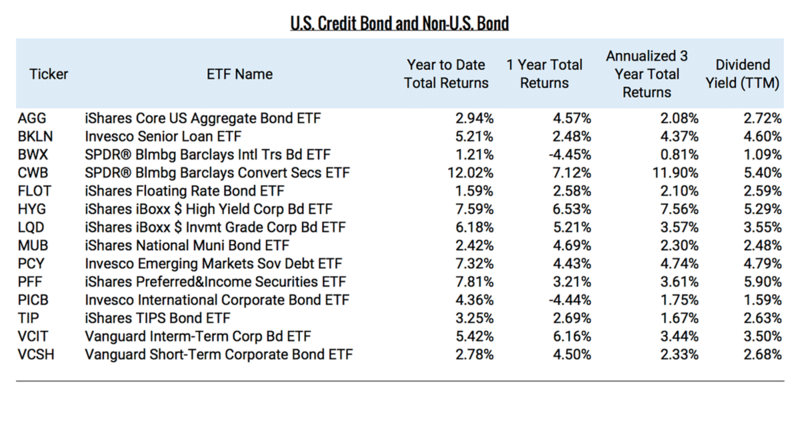 That may not sound like much, but it translates to a big month of returns for bonds of many varieties. This is very much a good news/bad news situation. That bonds are adding some price appreciation to their income yields is good. But the dive in Treasury rates may also be the market's way of telling us what I have been telling you for a while now: that a recession is coming. And while I will not go into great detail this month, this will continue to be a theme of this column, to guide you through the recession as an investor. Of all the areas of investment that deserve some myth-busting, recession-investing is perhaps the "myth-iest." More on that in future articles. Valuation: The Shiller CAPE version of the P/E ratio is near its 1929 level. The S&P's 10-year return is in the top 4% of its range of the past 60 years. Credit: Mortgage debt is approaching its 2008 peak. Massive growth in consumer credit is unsustainable. Sentiment: Consumer sentiment shows signs of topping. IPO-fever is back, reminiscent of the dot-com era. Companies with persistent losses worth billions. Geopolitical: China, North Korea, Iran, the U.K. (Brexit) all present potential financial market issues. My portfolios currently sit closer the middle of the risk spectrum than either the highly bullish or highly bearish end points. This reflects a belief that defensive investing should be front-of-mind, but acknowledges the fact that markets are currently in a good enough mood to not be in a defensive shell. That can change very quickly, so as always, I encourage investors to assess their own portfolios for the impact of a sudden change in the environment, as we had just six months ago. Remember that buy-and-hold investing has its drawbacks, as markets have changed. Investor complacency is a concern after a decade-long run in the S&P 500 and a two-generation-long run in bonds. Don't get caught off guard. Nasdaq outperformance this year is expected. The fact that micro-cap stocks have lagged the S&P 500 points out just how large-cap/S&P 500 Index-driven equity investing is right now. Tech and REITs lead so far this year, while financials and healthcare lag. Much of that has to do with two things: a return (for now) of bullish fever, and the additional spark of lower interest rates, which have powered REITs. One point of caution: REITs didn't used to be the kind of sector that would gyrate 10% or more up and down from quarter to quarter. That they have turned into that since the last real estate crisis (a decade ago) means that we have to reconsider how they are used in income portfolios. A quick look at the bookends of this group over the past three years tells us two things. 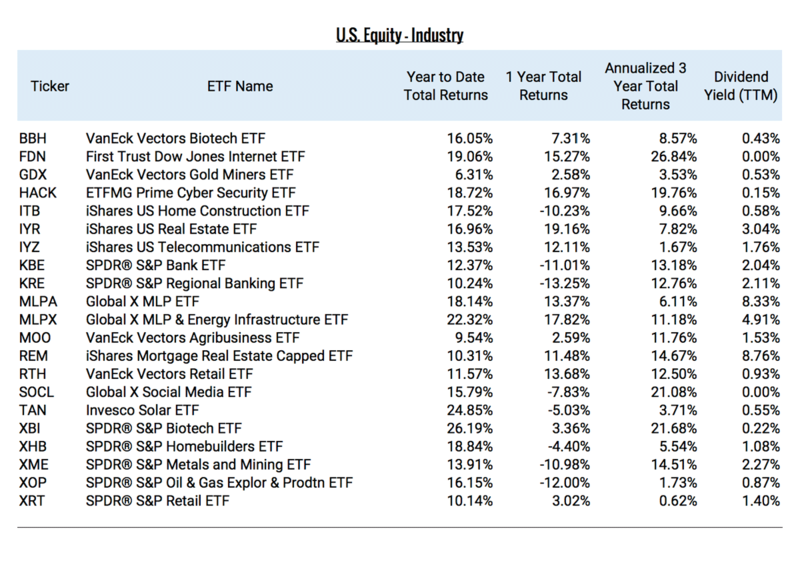 That every one of the 21 industries tracked has been positive over that time, and that the far and away leader is the ETF with the biggest exposure to so-called FANG stocks. Facebook (FB - Get Report) , Amazon (AMZN - Get Report) , Netflix (NFLX - Get Report) and Alphabet (GOOGL - Get Report) make up about one-third of (FDN - Get Report) . High Beta stocks (SPHB) rallied nearly 18% in the first quarter, which just about gets them back to even over the past 12 months. This is a microcosm of the issue of volatility explained in the charts above. ETFs tracking European stocks are showing at least faint signs of improvement, despite obvious shortcomings in local economies there. One explanation for this is that Europe ETFs are less about tracking Europe's economies than investing in the global business giants that happen to have their headquarters in Europe. Those businesses are more similar to U.S. multinationals than investors may be giving them credit for. But one thing we know is that in a global recession, there are few if any hiding places. Hidden in the S&P 500's glory the past three years is the persistent lagging of higher-yield stocks. 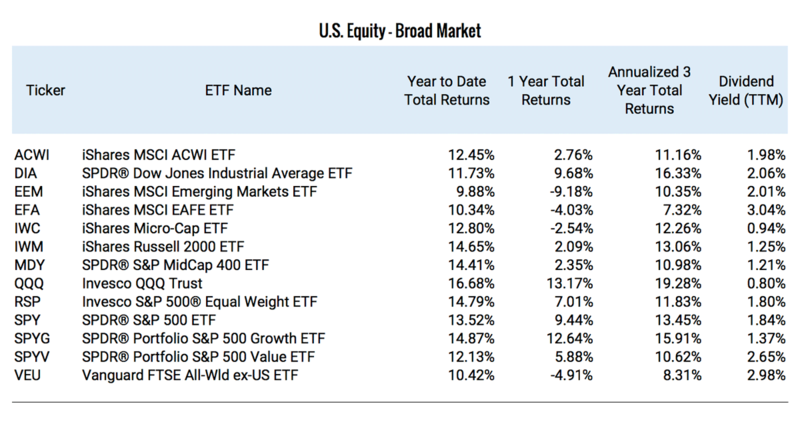 The majority of those tracked here have annualized returns below 10%, versus the S&P's 13.5% annualized figure. All 13 of them trailed the S&P 500 over the past three years. These stock/bond combinations are performing pretty well. 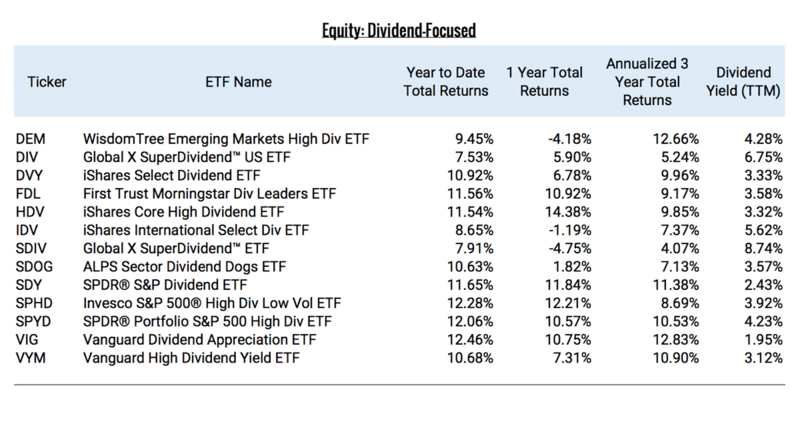 However, like the overall market, their dividend rates signify a dearth of investment yield available through traditional approaches. This will continue to be a thorn in the side of many investment allocators. Gold has been a quiet laggard, but it has shown some fleeting upside potential in recent months. I get a sense that its long-term potential is a bigger motivation to consider it than some gigantic imminent breakout in the price of the yellow metal. Just when Treasuries were starting to look good again, their yield crashed. Not shown here, but the 30-day SEC yield for all of these is between 2.31% and 2.75%. Translation: a very flat yield curve which is not healthy for the markets. Still, there is potential for a historically-strong move higher in prices of U.S. Treasuries, particularly the intermediate to long-term variety. A crash in yields might feel good temporarily, but it may cause other problems across the economy, and particularly in the banking sector. Last month, I expressed concerns about the lift-off in returns of convertible bonds. This month, same thing, except the focus is on preferred stocks and high-yield bonds, which both surged over 7% during the first quarter. I still think the clock is ticking on the low-quality areas of the fixed-income market, which impacts high yield securities. As for preferreds, the long-term maturities and utility sector exposure that make up the bulk of that market is OK as long as those market areas don't hit a wall following their recent surges in price. If you like this column, feel free to check out our podcasts here, where we share our thoughts, strategies and anecdotes. About the author: Rob Isbitts is an investment strategist and portfolio manager for high net worth families, and has more than 30 years of industry experience. A thought leader, book author and founder of a boutique investment advisory firm in South Florida, he focuses on breaking investment myths and bringing common sense analysis to his audience. Connect with him on LinkedIn, follow him on Twitter @robisbitts. Disclosure: This material contains the current opinions of the author, Rob Isbitts, but not necessarily those of Dynamic Wealth Advisors and such opinions are subject to change without notice. This material has been distributed for informational purposes only. Forecasts, estimates, and certain information contained herein are based upon proprietary research and should not be considered as investment advice or a recommendation of any particular security, strategy or investment product. Information contained herein has been obtained from sources believed to be reliable, but not guaranteed. Past performance is not a guarantee or a reliable indicator of future results. Investing in the markets is subject to certain risks including market, interest rate, issuer, credit and inflation risk; investments may be worth more or less than the original cost when redeemed. There is no guarantee that these investment strategies will work under all market conditions or are suitable for all investors and each investor should evaluate their ability to invest long-term, especially during periods of downturn in the market. No part of this article may be reproduced in any form, or referred to in any other publication, without express written permission. Rob Isbitts offers advisory services through Dynamic Wealth Advisors.